At the June conference one of GEM’s properties was recipient of “Development of the Year”. 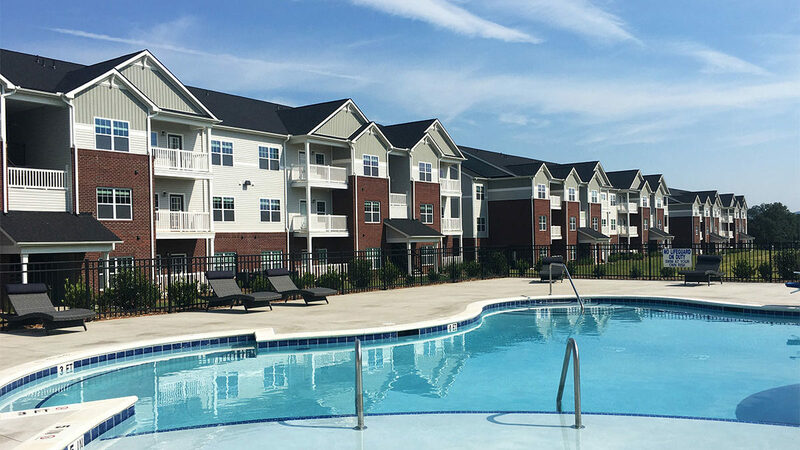 The Assembly is a 240 unit Low Income Housing Tax Credit community that opened the end of summer 2017 and within 8 month’s achiever 100% occupancy! This property has been featured on bus tours and articles showing that what our firm builds illustrates our purpose of quality affordable housing. The team worked tirelessly to assure the lease up was a success and that the property hosts excellent curb appeal and excellent customer services to our residents. Join us in congratulating the management team at Assembly and our development firm Flat Iron! Below is a link to the video presented on the Assembly. Hollis Fitch, accepted the award of behalf of our team and thanked everyone whom made this community a reality. Picture to right of Debbie Gibson, Site Manager; Ginger Kimbrell, Project Manager and Hollis Fitch, Partner. Picture to the right is The Assembly pool and clubhouse. Please take time to review the video of one of GEM’s newest communities.